How to become a Travel Agent in this day and age of the internet? ‘How to become a travel agent?’ is a question that I get asked most of the time. My first answer to that is, ‘don’t become a travel agent’, a ‘Travel Agent’ is an order taker and may not be needed in this day and age of the internet. The internet is very capable of taking and executing orders. So, if I have to exemplify this, an order can be ‘Find me a five-star hotel in Orlando’. OR ‘Book the Comfort-Inn in Chicago for September 23rd for 3 nights’! Now do you get it? What we need today is a ‘Travel Consultant’. The steps below will help you start your travel agency. Affiliate with some large OTA’s and join their affiliation program for example Expedia Affiliate Network. These programs work on a pay per sale affiliate commissions model. So, if you book hotels or flights for clients, they offer you a commission. This commission is directly credited to your bank account. Traditional Travel Agents need to take up an IATA certification where they teach you how to book a flight from a green screen terminal (so not cool). You have to then apply for a PCC (psuedo-city code). These codes help the CRS’s (Central Reservations Systems) like SABRE and Gallileo identify your bookings with the travel agency code. After all this training and setup, you will still need to strike deals with airlines for your private fares or you will not be able to compete with the big boys. It’s a catch 22 situation because airlines will not be interested in striking deals with you unless you can show volume business. Thus the traditional way of becoming a travel agent is too much work unless you are going in full time with deep pockets. These affiliation programs require you to have your own site. So, check for good Online Travel Agency – Turnkey Solution that does not burn a hole in your pocket. You should not spend more than $250 as a onetime investment for this activity. This is an important step, as the affiliation program will check the site and give you the commissions. Secondly, the parent affiliate like Expedia will handle the payment and the rules around it, so you don’t have to worry about the compliance issues. A well-designed online travel site. A blog section where you can showcase your expertise in your niche. Engage with travelers who are looking for a specialist. In my white paper “5 Secrets to Build the Next Generation Online Travel Business”, I have given more details on how to choose a specialty and build your brand. You can download this white paper NOW, by putting in your email address in the box on the right. So, now that you have a website and you can book hotels and tickets for your friends and family from your own website, it is important that you promote your site on social media so that you can keep increasing your revenue and what better than have someone book through your site and you make money while you sleep!! Set up a good SEO & SEM strategy and get noticed by search engines. The best part is that a travel consultant does not need an office or any infrastructure, it is one the many business ideas that help in creating passive income. You can do it along with your current job/business. In a few months when it starts generating enough revenue, you can make money online and think about quitting your day job. So, all you need is a well-designed website and a couple of hours of work every day to get yourself popular on the internet. You can read my post ‘SEO for Online Travel Sites’, where I have given detailed information on how to make money online by optimizing your website in a way that travelers can find you and book through your website. What is the job description of a travel agent / travel consultant? It is very important to understand the job description in terms of roles and responsibilities of ‘How to become a travel agent’ before you commit to it. Given below is the list of things you will have to do and spend time upon, on a daily basis to get your online travel site to be noticed on the internet. What should you ask yourself before you take up the role of a Travel Agent? How do I feel about giving someone the memory of a lifetime? What excites me about being a travel agent or a travel consultant? How has your life prepared you for this role? What would I do differently if every other site on the internet is giving the same boring itinerary? If you have a day job and cannot attend to your clients, how would you deal with this differently? What kinds of questions would a client have and how would you address them? Describe your approach to planning a complex itinerary. How to become a travel agent with an investment of $250 only? Download and install the QuickTravel theme in your WordPress website. We also offer to help you with the installation, for a small fee. Enter your EAN (Expedia Affiliate Network) account ID (CID) in the admin section of the WordPress website. 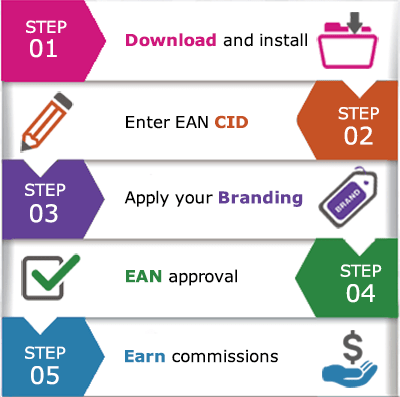 You can use your existing CID or get one from the EAN website. Now your site is ready. Customize the color scheme, layout and content of the website as per your branding requirements using an easy-to-use admin panel. Get your site approved by EAN. With this, you are ready to earn booking-commissions, directly from Expedia! Are you ready to start selling travel? Rated 5.0 / 5.0 for Travel Website Development Services by 1250+ QTA clients on 2,000+ online travel sites.